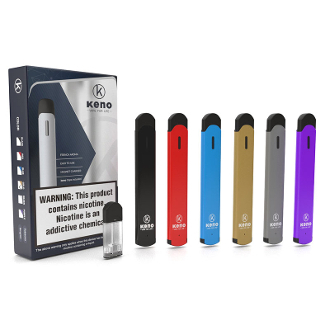 The MyKeno Pod System is a slim and palm sized device with a respectable 380mAh battery life. Its size makes it discreet and easy to carry. While the output power of 6-12 watts has a solid throat hit, it still gives the user an inconspicuous amount of vapor. The MyKeno Pod System comes in a variety of colors to choose from. We are sure we have a color for you. This device does have replaceable pods which makes it easy to change with literally a flick of the wrist.